And we thought that $99.99 at Sprint was a deal! 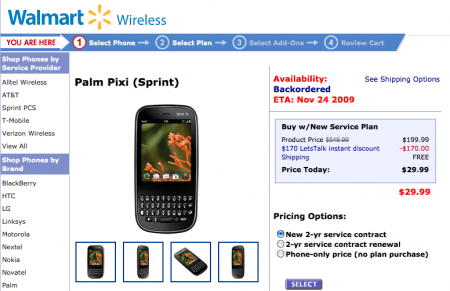 Wal-Mart’s online wireless store has the Palm Pixi up for pre-order at a frightening low price: $29.99 for new contract customers. What would set you back $200 out-the-door (less a $100 mail-in-rebate) at a Sprint store is only $30 at Wal-Mart. As we said, this is for new contract customers only, with a contract renewal Pixi costing a hefty $249.99, and off-contract weighing in at $499.99. 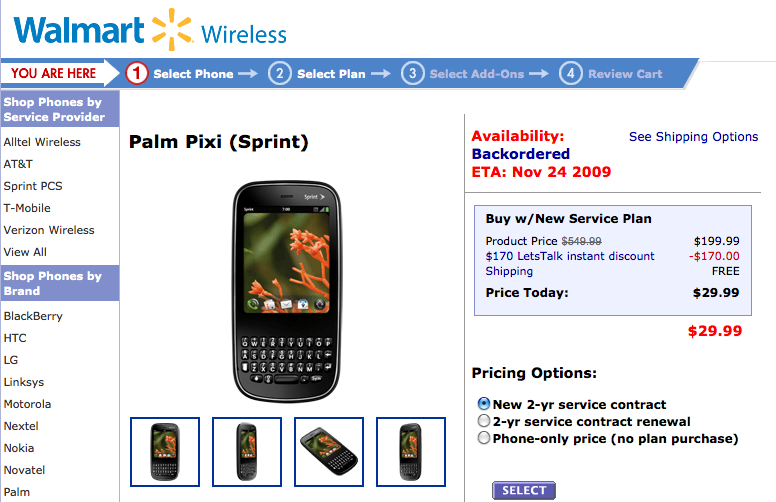 Wal-Mart Wireless lists the Pixi for pre-order and as having an estimated in-stock date of November 24th, while Sprint stores and affiliates like Best Buy and The Shack can expect to have it on the 15th, this coming Sunday. Thanks to Shadow-360 for the tip!